They say you shouldn’t work with children or animals, but we say that’s untrue! We love working with the animals who are under the care of Dr Billy McCartney in his high tech veterinary hospital on Dublin’s northside. Strategy work included peer review analysis where we reported back to the client on the state of the industry for social and who was doing what. Then we listened to the very respected Dr McCartney talk about the industry, competitive forces and changes in how independent vets are responding. It became clear that the client needed to target a B2B audience, ie. 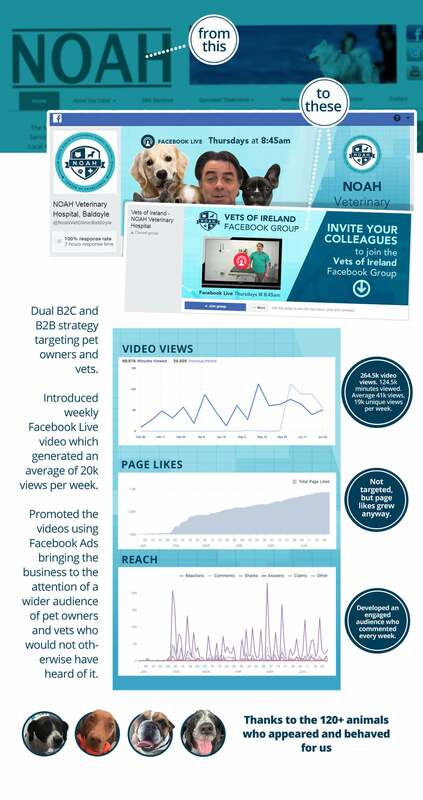 vets who make referrals; and a B2C audience, ie. pet owners who can request a referral from their vet. So we set about identifying content and distributing it in the platforms where these people would most engage. This was the easy bit and working with a client such as Dr McCartney who is open to taking our suggestions made it even easier! Brightspark prescribed a weekly Facebook Live for the good Doctor, and the team at NOAH really got on board with this. It’s always really enjoyable to watch people gain confidence on camera thanks to our direction. Facebook Live enables businesses to show not tell, and allows consumers to learn about the business in a very real and authentic way. Put it this way: we only recommend Facebook Lives for businesses who truly walk the talk and are experts in their field because it shows. Weekly Facebook Lives where Dr McCartney and his charming team showed some of the animals who were in under their care garnered between 10 – 15,000 unique views every week. 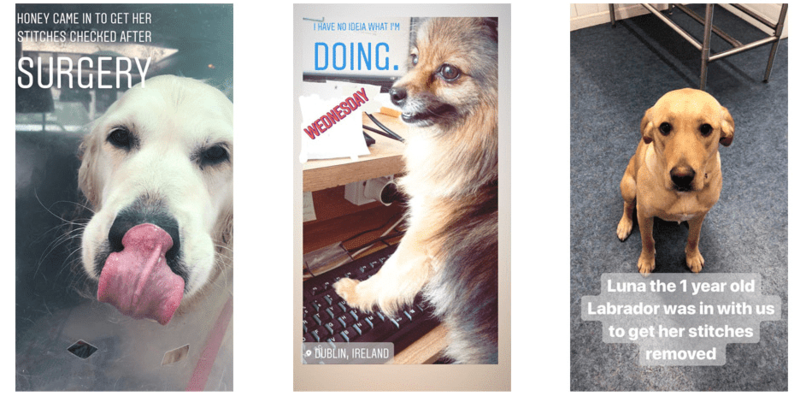 We used it to develop an audience, and were able to use targeting to ensure that the video content got into the newsfeeds of pet owners in Ireland who matched our ideal client characteristics. Follow up stories of the animals going home were posted over on Instagram and Instagram Stories was used by the team to show behind-the-scenes footage and to truly convey the care and love that the NOAH team have for the pets under their care. We provided training for the team to look after the Instagram themselves. From a social media point of view, it’s Instagram gold! Everyone knows that #DogsOfInstagram rule the world. Having an abundant supply of cute puppies and cats, and even the odd snake or bird is social media content management heaven! Creating specific social media content for vets – video content where Dr McCartney talks to camera about specific procedures or diagnostics that would be of interest to vets. Publishing this content on a Facebook Group which is only open to vets to join. The social media content for vets was also promoted on LinkedIn and, to a lesser extent, YouTube. The results for the vets are growing, although not at the speed of growth for the consumer market. The number of vets who join the group is increasing each month, and there is now a focus on driving engagement. Dogs are more popular on social media than cats! Animals are surprisingly easy to work with – easier than some clients! Vets love the icky operations, but don’t want to talk about it! As with all social media marketing, promoting a veterinarian business on social media is about effecting cultural change. The whole team needs to be on board: to take part in the Facebook Lives, to capture the behind-the-scenes Instagram action, and to be consistent and do it often, and again, until the bookings come through. People love to consume content from vets; they do not want to be sold to. They are quick to make comments, send messages, and bookings as soon as their pet needs it. To succeed as a vet on social, you’ve got to be there for the long haul, sharing your messages, telling your story, positioning your business with the right people, so that when the time comes that someone who’s watching needs you, you are the first person they will turn to. Would you like to have a conversation about this? Are you a vet in the UK struggling with social? Or are you a totally different business but similar in respect of needing to promote yourself to consumers and business alike? Dual B2C and B2B social media campaigns are a bit of a speciality of ours. Get in touch. Let’s have a conversation. Whatever your business, Brightspark can help.